Ayers Rock Uluru – Free To Download Worksheet. You can print and use this easy science worksheet about Ayers Rock Uluru by downloading it for FREE! Our free wordsearch printable science worksheet for kids is a fun activity sheet on Ayers Rock facts for kids. With our fun science for kids printables, children will enjoy learning about the Australia Ayers Rock and the many other easy science for kids topics our science kids website covers! Uluru is found in Australia. The Uluru natural wonder of the world is also known as the Ayers Rock. This huge mountain is made out of sandstone. Find out more with your kids from the printable word search puzzle game you can download. The Uluru in Australia facts worksheet is suitable for primary school kids. If your child is in grade 1 – 5 this free worksheet is perfect for him or her. If you enjoy doing after-school activities with your kids, or if they are sick and away from school and you wish to spend some quality time doing extra school curriculum activities with your kids, then our activity sheets and fun interactive science quizzes are the perfect solution; they enjoy your presence and tutoring while doing fun activities. Even Pre-K or kindergarten kids can enjoy learning about Uluru in Australia if you read the Ayers Rock Uluru information to them! Then you can ask them the questions in this worksheet, and this provides a perfect opportunity for a listening comprehension training for kids. 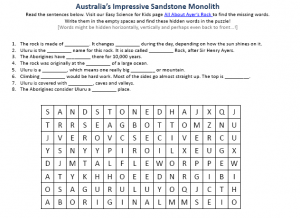 [sociallocker]Get this FREE printable word-search worksheet for kids about Ayers Rock. Download the Ayers Rock Uluru Worksheet! Declan, Tobin. " Ayers Rock Uluru - Free to Download Worksheet - ." Easy Science for Kids, Apr 2019. Web. 26 Apr 2019. < https://easyscienceforkids.com/ayers-rock-uluru-free-to-download-worksheet/ >.